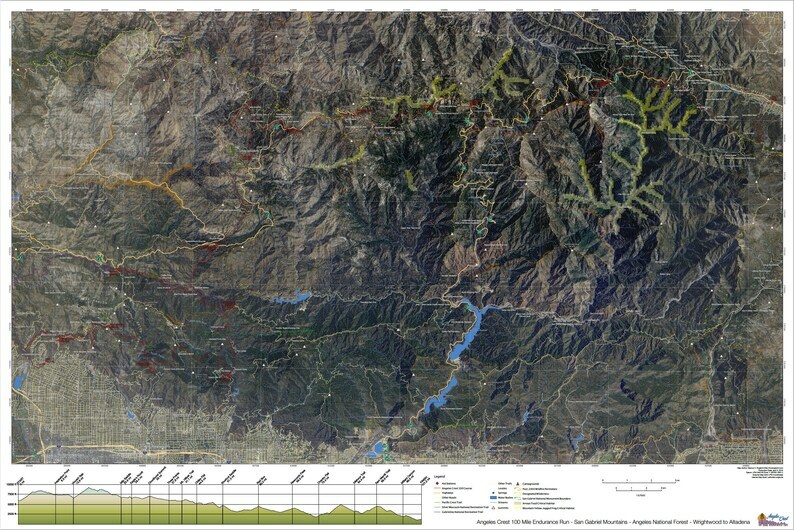 This is a detailed map of the Angeles Crest 100 Mile Endurance Run course, as well as the surrounding San Gabriel Mountains. Included on the map are roads, trails, mountain peaks, recent wildfire perimeters (as they affect what you see on the course), critical habitat designated under the Federal Endangered Species Act (as it has affected the routing of the course), and important locales. The original image is optimized for 24X36 inch printing, however, it also available in a half-size 12X18 inch print. I have not proofed that size for print legibility.